Sai International School & Jr College Kolhapur (Sai International School & Jr College), Kolhapur published a new job notification for Teacher, Lab Assistant, Campus Administrator Posts. The recruitment is for total 14 Vacancies. The willing candidates are informed to see the latest notification March 2019. Walk-in Interview on 30-03-2019. For More details of Sai International School & Jr College Kolhapur Recruitment 2019 Read Below. 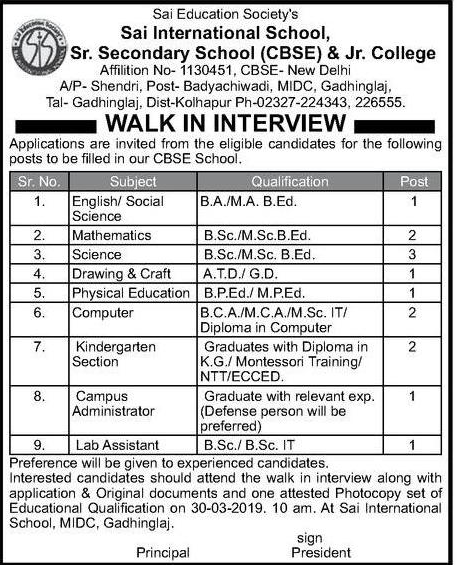 Interested & Eligible candidates may attend for walk in interview along with all the documents addressed at Sai International School & Jr College, MIDC, Gadhinglaj, Kolhapur.